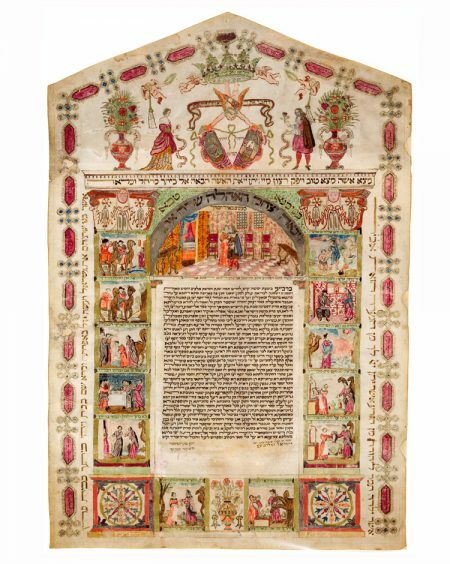 This ketubbah illustrates the custom among Italian Jews to reuse beautiful ketubbot from the past. Its text, in fact, commemorates a wedding celebrated seventy to eighty years after the original contract and its border was created. Here, the entire original text was meticulously erased and replaced by a new one written in Padua 1828. The artist who designed the border created a well- balanced layout in which the meaning of the detailed vignettes is easy to follow. Thirteen miniatures surround the text: five on each side, two below, and a central one above. The scenes depict the wedding story of Isaac and Rebecca, accompa- nied by quotes from Genesis. Beginning at the upper right and proceeding clockwise they include: 1. The Sacrifice of Isaac (Genesis 22:12); 2. Abraham sending Eliezer to look for a wife for his son (24:4); 3. Eliezer praying to God before going (24:12); 4. Eliezer asking Rebecca for some water (24:17); 5. Rebecca handing the jar to Eliezer (24:18); 6. Rebecca refilling her jar (24:20); 7. Eliezer presenting Rebecca with gold jewelry (24:22); 8. Laban inviting Eliezer to enter the house (24:31); 9. Laban preparing the table for Eliezer who tells him he will not eat before being heard (24:33); 10. The family bidding Rebecca farewell and blessing her (24:60); 11. Eliezer and Rebecca returning (24:61); 12. The meeting of Rebecca and Isaac (24:65); 13. Isaac bringing Rebecca to the tent of his mother (24:67). It is likely that the original ketubbah was created for a couple whose first names were Isaac and Rebecca. Although the verse in the lunette above the text refers to the biblical couple, the scene depicts a contemporary man and woman standing in an eighteenth-century interior. The vignette allows a rare and intimate view into an affluent Jewish home on a wedding night. At the top, another unusual scene features a fashionably dressed man and woman on either side of Cupid, who unites their family emblems. The groom offers a flower while the bride proffers an apple as they exchange words of love from Song of Songs 2:2–3. selected literature Sabar 2000, pp. 104–105. Dowry: 100 shekalim of pure silver, Venetian coinage; increment: 25 shekalim; total obligation: 125 shekalim. The actual amounts were recorded in a civil contract drawn on 18 June 1828 by the public notary Dr. Francesco Traversa.